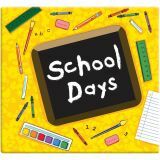 School Days Album 12"X12" - MBI-School Days Post Bound Scrapbook Album: 12x12 inches. This high- quality album features a coated paper covering with a fun school design, ten 12x12 inch page protectors with white cardstock inserts, and is expandable with additional pages and posts (not included). This package contains one album with Yellow School Days design. Measures 12-1/2x13-1/2x1 inches and is acid free and photo safe. Imported.